Want to Watch Movies At your House The Same Day They Come Out In Theaters??? Well Now You Can!!! Have you dreamed of a world where you can watch movies the same day they come out in theaters in the same excellent quality of sound and picture that are in the movie theaters? Well your dreams have come true. In recent weeks you might have heard some talk of home digital delivery systems. Time Warner announced that they will be launching a premium video on demand service next year that will allow their customers to watch movies that are still in theaters. Details are not out yet, but it might be a month or two after the initial release date. The cost per film will range in about $20 – $30 dollars per film. 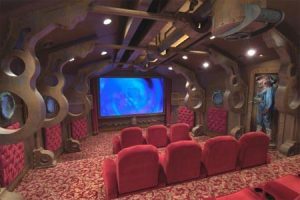 Now yes, that is more expensive than going to the theater, but I think it is a fair price to have movies in your living room that are still in theaters. But now there is a new service called Prima Cinema which will allow its customers to watch movies the same day they come out in theaters. There is a catch though. A really big catch. The service will run you $20,000 dollars. That is only a one time fee. But the cost per film will be $500.00 per film. That is pretty astronomical for movie lovers. Is there even a market out there for super rich movie lovers?? Questions that arise in my mind, are how does this company plan on making money if they limit their market to the super rich? By doing this service, how do they plan to protect these films from pirates who could potentially get these amazing quality digital films? And how do they plan on convincing the movie studios and movie theaters to sign the rights over? It will be very interesting to see what happens. Personally, I still love going to the theater and sitting with loved ones and friends with a packed audience and watching a film. It is the whole experience. See the Ultimate Badass Poster for a Film Called “Rubber”!!! It’s About A Killer Tire!!! This entry was posted on Wednesday, December 8th, 2010 at 11:55 am	and is filed under News. You can follow any responses to this entry through the RSS 2.0 feed. You can skip to the end and leave a response. Pinging is currently not allowed. « Geek Deal of the Day: Complete Series of The Funniest Show Ever Made!!! Arrested Development!! !